This offer official ends Nov. 14. Almost 200,000 LEDs have been purchased! Thank you. Look for a similar offer next year. Do you know a good deal when you see one? Then keep your eyes out the next time you’re shopping at H-E-B. 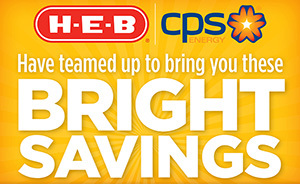 CPS Energy is offering a one-of-a-kind discount at San Antonio H-E-B stores that will allow you to not only save on your grocery bill, but on your energy bill, too. For a limited time, you can pick up an energy-saving LED light bulb for only 97 cents, with an in-store coupon. That’s less than a buck for a high-efficiency light bulb that retails for almost $7. CPS Energy is picking up the tab on the $6 difference. You can purchase up to three bulbs per visit or transaction. LED bulbs are the latest game changer in energy efficiency for your home or business. According to the U.S. Department of Energy, LED lights use less energy, emit less heat and last longer than conventional, incandescent bulbs. The offer is good for a 9.5-watt, soft-white LED bulb, which is equivalent to a 60-watt incandescent bulb. You can purchase up to three bulbs per coupon. High quality (or Energy Star®-qualified) LED bulbs can be up to seven times more energy efficient. They use 80 percent less energy than conventional bulbs. LED bulbs have a useful life of 25,000 hours or more. Compared to other bulbs,compact fluorescent lights (CFLs) last 8,000 to 12,000 hours, while incandescents generally last only 750 to 2,000 hours. LEDs give off light in a specific direction, so they are more efficient than incandescent and fluorescent bulbs which waste energy by emitting light in all directions. Because LEDs operate more efficiently, with little wasted heat, they also can reduce cooling costs and are cooler to the touch. LEDs are more durable. They don’t contain glass components so they won’t easily break like conventional or CFL bulbs. The discount is supported by CPS Energy’s Save for Tomorrow Energy Plan. The program is focused on reducing the growth in our community’s demand for electricity by 771 megawatts by 2020 – that’s the output of a large power plant. Why choose Energy Star qualified lighting? Yes. The offer officially ends today. But as of Wednesday, they only had a very limited supply available at certain stores. The response was overwhelming. 200,000 LEDs were sold in one week! Thanks for your interest. We hope to offer a similar deal next spring. When can we expect to see this offer again? Thanks for the question. As I understand, we are still working on details, but hope to offer it again with HEB some time this April. It is April. Any update on another promotion on LED bulbs at HEB?